Power plants use Nitrogen Generators for multiple applications. Here, we'll discuss some of the more common applications as well the reasons that plant managers choose Nitrogen Generators as their preferred N2 gas source. Nitrogen Purge for HRSG Wet and Dry Boiler Lay-Up - Corrosion is a real threat to the performance, safety, and longevity of boilers and boiler tubes at power plants. Nitrogen is an inert gas that protects against the corrosion of inner walls of boiler tubes, condensers and wetted parts. N2 gas works to displace the presence of oxygen, one of the key players in the corrosion triangle, thereby effectively inhibiting the formation of corrosion. When the boiler units are offline during a lay-up, Nitrogen Generators provide an N2 blanket in the boiler drums. 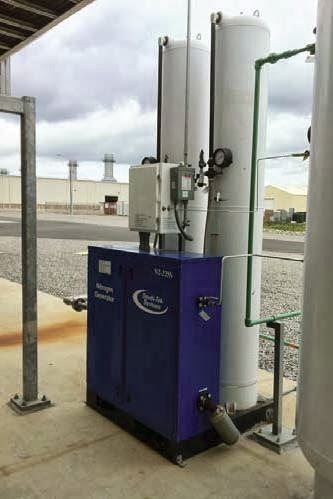 Case Study: A Power Plant in Northeastern United States recently installed a South-Tek Systems' Nitrogen Generator in two of their combined cycle facilities after realizing the possibility of corrosion in their boilers. The capacities of the plants are 407 / 500 Megawatts and are used for dry and wet lay-ups with one volume purge every 24 hours. One of the facilities is a peaking facility, so the Nitrogen Generator will run more frequently. When the units are offline, they provide a N2 blanket in the boiler drums. The Nitrogen Generator is also used to blanket on the tube side of the feedwater heater during extended outages. Their other plant is a base loaded plant, so the Nitrogen Generator is used for boiler drum blanketing when the unit is offline for an extended period of time. With a Nitrogen Generator in place, operations are running smoothly and their concern for corrosion no longer exists. Ammonia Purge - Some Power Plants use Nitrogen Generators for blanketing ammonia storage tanks. Nitrogen is connected to the ammonia storage tank's vapor space to provide a nitrogen blanket on the system. The intent of using a nitrogen blanketing system on aqueous ammonia tanks is to prevent the ingress of air to the tank vapor space during low ambient temperature conditions when the vapor pressure of the ammonia drops below atmospheric pressure. Natural Gas Purge - An increasing number of Power Plants are utilizing natural gas. When a leak occurs, the site evacuates natural gas using Nitrogen within the piping system before repairs are made to reduce the possibility of explosions. When performing this procedure, the nitrogen fill valve is opened to pressurize the pipe. A pressure gauge is used to monitor pressure loss and check for leaks. Precautions are taken when releasing the purged gas into the atmosphere such as proper ventilation. Being inert, Nitrogen reduces the risk of explosions and extends the life of Power Plant equipment. Nitrogen Generator equipment is increasingly used in power plant applications due to the ability to produce an unlimited supply of Nitrogen on-demand at the facility, eliminating missed deliveries, escalating costs and contracts. This equipment is also a convenient, safe, and more reliable alternative to delivery and handling of bulky, compressed gas cylinders or tanks. South-Tek Systems is a world leader in designing and manufacturing Nitrogen Generating Equipment. We have extensive experience working with the power generation industry. Our Nitrogen Systems are safe, reliable, and cost effective. Plus, we offer engineered solutions that help us monitor and track installed systems for performance, optimization, and safety. Contact South-Tek Systems today to learn how our N2-GEN Systems can benefit your power plant facility: 888-526-6284.